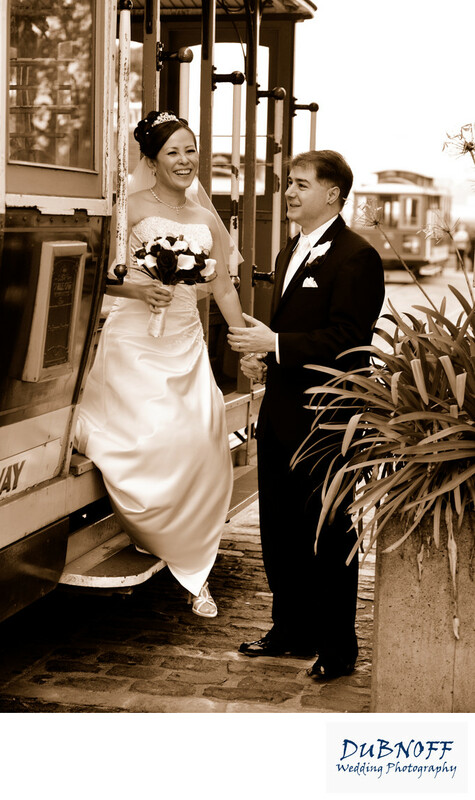 Using Sepia tone in this wedding picture of a newlywed couple leaving a Cable Car in San Francisco provides us with old fashioned look that goes along with the vintage look of this iconic trademark. People associate Cable Cars with San Francisco and these trolleys have been around since the days of Sepia Tone photos. Sometimes wedding photography is about evoking a certain mood for feeling. I wanted this image to remind viewers of old time San Francisco, but at the same time display the love between the couple and their enjoyment of their wedding day!